Posted in Consciousness, Creativity, Culture, Eben Moglen, Education, Evolution, Future, Occupy. Thank you SO much for this podcast. It has changed my life for the past 5 months and most likely for years to come. Heaps more besides but there are the nuggets for me. Thanks for the C.D. link. I didn’t find find the 93M cbr file they mention but snag the 24M pdf file. i guess that was the object. I’m surprised I hadn’t heard of Ready Player One before now, as novel and original as it sounds but I appreciate your tipping us off about it now. Sounds great. …And I presently do live in Oklahoma City, to boot! I’m watching Spectres Of The Spectrum, by Craig Baldwin, at the moment. right after watching The Secret History of Hacking (Complete) 2012 which reminded me of Steve Wozniak’s begetting of Apple actually began with Blue Boxes, ironically enough. and of the real pioneer hackers like Benjamin Franklin, who caught lightning in a bottle from the Aether, and Samuel Morse, the first to electrically transmit actual intelligence instead of mere power, and finally come around to Marconi, Faraday, -all those pioneering radio guys -and this DVD I’m watching keeps underscoring it all… the spectrum is ours. any and all spectrums. Eben’s talk had led me to other youtubes of him. listening to them, i’m struck by the incredible facility of even just his perspective alone; unintermediated freedom of thought creatively followed. time *is* short, and we *are* in a cusp period fraught with responsibility, but the cosmic giggle has it’s place at the table too, & perhaps first and foremost at the head of it if there’s to be one, right? well, i cannot recommend Craig Baldwin’s work enough. particularly Spectres Of The Spectrum. i simply cannot. perhaps the cosmic giggle can be viewed as a spectrum. and a network. @Zuma, Thx for the good vibes, brother. I’m headed to a listen of Mr. Doctorow, right now, who I also know as a print comic genius (ala Futuristic Tales of the Here and Now). I’ve been in and out of comic-land for many years (sometimes I just can’t handle the level of geek), but I always seem to come back to them by way of something new and incomprehensible. Did you know that Timothy Leary put out an independent comic in the 70’s explaining his 8 circuit theory of biology? That is worth looking up. this speech for me at the time i first heard it was also a major speech. still is. albeit now just one aspect (to me) of Eben’s magnum opus. private emails become much less important. amazing. clearly thought out and carefully articulated. a completely central speech, certainly. a major speech. *the* major speech. involved with cartooning and comics as i am, i noted recently on The Comics Journal Site an article talking about the explosion of mini-comics throughout the world by independent creators and i saw that as versus the corporate model moving toward apps and digital content delivery platforms like tablets. 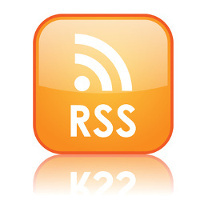 -which the coming Windows8 embraces as a GUI model. Intermediaries are indeed a crux of herdchuting control. a huge pre-internet network was the mail art culture (not unlike the comic book fandom network of the 1960’s that i saw and was a part of when i worked (free) for G.B. Love on his RBCC fan adzine that was so instrumental to it) that i was introduced to by Matt Howarth when i drove up to meet him and hang out with him for a month in Philly in 1980. several hundred mikes into my system and i’m handed the very first Stark Fist Of Removal. what the heck? what culture sprung *this thing* out?? he showed me a room piled to the brim of an entire universe comprised of self-published cassettes and xeroxed stuff that was so unbridled, so original, so various -and so unpublicly networked. no corporate intermediary whatsoever involved, and impossible to do so. the mail art culture still exists to this day even btw. self-commodification, ala The SubGenius Church, was a very tittilating notion. Stang was brilliant, certainly, and totally outside convention. so i have these past experiences informing and influencing my considerations of what Eben says. yes, i’ll listen to it again. & then again. “Now, take your f***ng computer and code your freedom” -Anon. Good stuff Mr and Mrs Lorenzo! 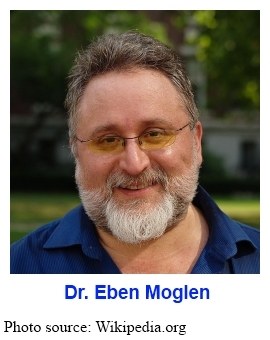 You now have a veritable sub library about Eben Moglen. Amazing how extraordinary people like Eben pop up in the flow and create a whole new set of doors and windows for us to look through. Eben feels to me like an authentic human being.